A turntable is a circular rotating device that is used for spinning and playing sound recordings. They have been around for a very long time particularly in their modern form. In fact they are still being produced today, with better and different features for different prices. Choosing a turntable should not be hard if you know what your needs are and what you need to look out for. The best of them all are those that come with inbuilt speakers that are powerful and of great quality. 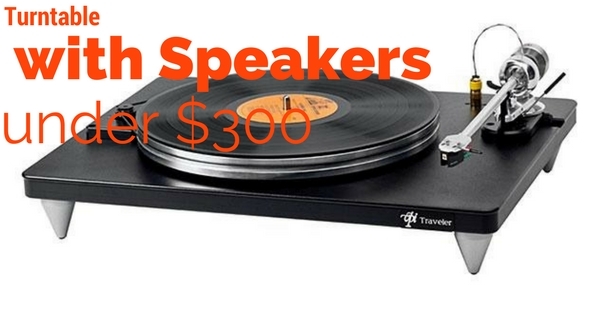 Just as its name suggests, this is a 3-speed turntable with amazing features. They include the AM/FM stereo radio and two inbuilt speakers. These are front facing so that they can project good sound. It comes with RCA speaker output jacks as well, a stereo headphone jack, a dust cover and a power indicator. It has an antique wooden case design which gives it a classy look. The Jensen JTA 222 is powered by 120V AC power. It is packed with all the features that you need, therefore it is ready to use after purchase. If you love to listen to older records in a nice and simple fashion way, this is just what you should buy. You will get all this at a very fair price. Its transparent dust cover will protect your turntable. This ensures you keep all your records safe when you are playing them. It is very easy to store. It can fit very well in a shelf, a bookcase or even a table. It is small in size and compact, which is why it is easy to keep away. It has very powerful front facing speakers which produce great sound. You can also connect it with your home stereo system for more sound using its RCA audio output jacks. It may not be the best system for your loud party. You may need to connect it to your stereo for more powerful sounds. The Electrohome stereo system has a very classy design. It is made of real wood and it can play all your favorite collections. 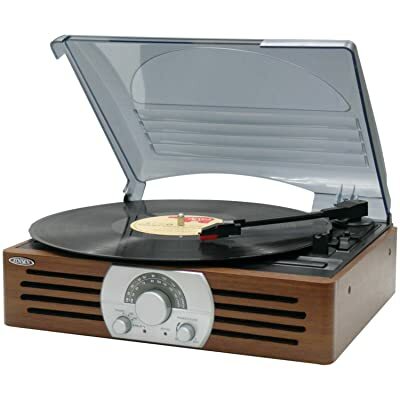 It plays both vinyl records and CDs with excellent sound quality. You can also tune in to AM or FM radio to enjoy more entertainment. This is therefore a system that casual listeners as well as music enthusiasts will enjoy so much. It comes with an auxiliary input for any music playing device. These include your Smartphone and tablet, therefore you are not limited as to how much you can enjoy with this turntable. It has very powerful in-built speakers too. They have hi-fi sounds, which are all housed in a wooden acoustic cabinet for the best in audio performance. This is a very good wooden stereo system for entertainment purposes. It has everything you need to stay entertained throughout. It has very powerful speakers that will give you a high fidelity sound. Therefore you will be able to enjoy your favorite record, radio station and CD. It comes with a headphone port too for private listening. Its construction is beautiful and of high quality, something you will enjoy for a very long time. Its sound may not be the best for a loud party. This is the best system for anyone who wants to enjoy yesterday’s charm in the best of today’s technology. The manufacturer has given this one the best combination of the best design. It contains the best features that you will get in a modern stereo system. 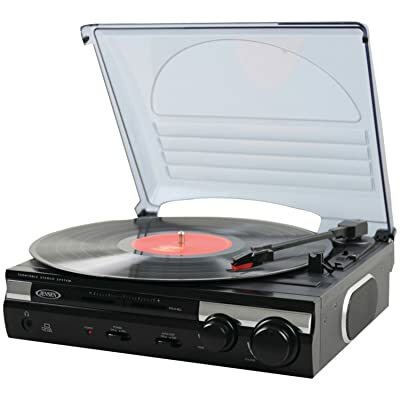 However it looks like a classic turntable due to its ultra cool retro design. It will allow you to enjoy your entire music library with great sounds. 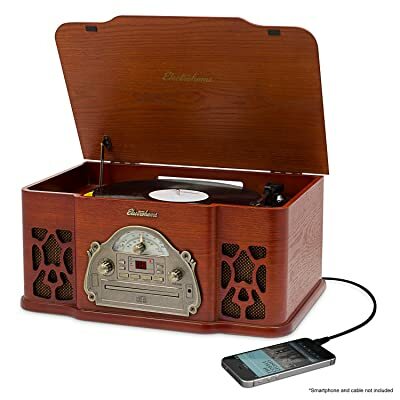 With it you can listen to your record collection, AM/FM radio, MP3s and also connect to your tablet or Smartphone. If you prefer private listening, you can connect it to your headphones. You are also able to transfer your vinyl music to USB so as to take your music everywhere you go. Its main strength is its authentic nostalgic design. This makes it even better not just for entertainment bit also as a great addition to your home. It is a great value of your money. For all the features it provides, you will pay a fair price to have it. You get a wide choice of entertainment options form radio, MP3, CD, and also music from your mobile devices. It has great quality speakers that will produce fidelity sound for whatever music you love to listen to. You can opt for private listening too, as it comes with an inbuilt headphone port. It is very beautiful and of great quality. This will add great value to your home and due to its strength in construction, you can be sure to enjoy it for a long time. This is a very powerful 3-speed stereo turntable. It comes with some of the best features to ensure that you are enjoying music to the fullest, any day, anytime. It has great sounding in-built speakers to give you the kind of sound that will keep you entertained. It also comes with software which converts records to MP3. This ensures that you are enjoying your music even on the go. This is made possible through the USB port and cable that are provided on purchase. It has a RCA line out that you can use to connect it to your stereo to produce more sound if need be. You can easily control the pitch and tone of your music to get exactly what you want to listen to. An auxiliary input jack is provided. You can connect your MP3, iPod and any other digital audio player you might have to your stereo. Its pitch adjustment and tone control feature helps a lot to determine the kind of music you want to listen to at all times. It is a small in size, therefore easy to store. It can fit well in a shelf, book case and also on your table without taking much of your space. Its small in-built speakers sound great and therefore can be sufficient for powerful entertainment for you for a long time. If you are hosting a party, it may not provide enough entertainment especially if you are looking to have a loud party. This is a very powerful 3-speed selectable turntable that comes with amazing features to give you the kind of entertainment you need to have the time of your life. It has an AM/FM stereo radio option with an analog tuning which gives you full entertainment on radio. It has 2 inbuilt speakers that are quite powerful. These will give you quality sounds of any music you will be playing on the stereo. It has a line out jack that can be used to connect the stereo to other external speakers to produce greater sound of you want to play louder music. 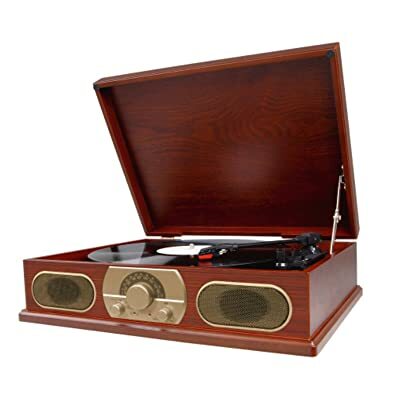 Its antique wooden case design makes it very strong and durable, therefore this is a turntable that can stay with you for a very long time. It has great features of endless entertainment. Its antique wooden case design will look great in your home. It has great quality and powerful speakers that will produce great sounds whenever you are playing your favorite music. You might need to connect it to external speakers to increase their power. Turntables are still very valuable even in the modern day. You should make sure that you have one if you want to bring out the best in music. They provide great entertainment and depending on the features you go for, you can enjoy music from many sources. 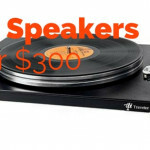 There are different types of turntables with speakers in the market today depending on their size and features. This is a great guide to follow if you do not want to miss out on an important feature whenever you are making a purchase. Enjoy your music as much as you can with a new turntable.